Who remembers the 1991 Wacky Packages designs done by Pat Piggot? I once wrote to him and he sent me a list of the Wackies he did for the never released 1992 Wacky Packages 2 series (2 of them - Brainola and My Spittle Pony - ended up in Wacky Pack Flashback 2 as LOST WACKIES stickers). I like this one he did! One of the many reasons I love this new forum is that posting web images is an easy copy and paste with a highlight and a click. You can right click on any web image, select Properties, copy the address (URL), paste it in a post, highlight the address, and then click the Insert Image icon (5th icon from the left, above the crazy faces). Just a copy, highlight, and a click. Easy as pie. Being a Simpleton at heart, I appreciate Brad's forum making my life a tiny bit easier. 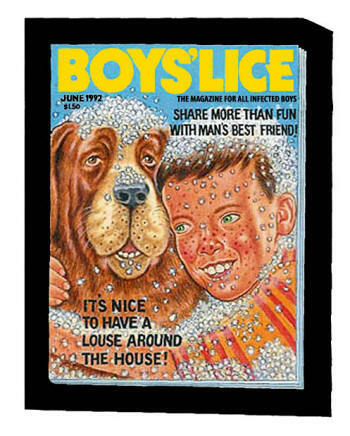 Thanks for posting that "Boys' Lice" image. I had never seen it until today. Very well done art on it. I'm going to sound like Daryl here....but Pat Piggot should release a home made parody series with all pig related parodies. He could call them Wacky Pig-ckages...no wait, that's dumb....Porky Packages! I think Pat Piggot is retired from the Wacky Pack business now.